Tell that college boy that if he doesn't have that report ready in 30 minutes, I'm going to go over there and do an autopsy on his face! You got that? Photos from the film, poster art from different releases, VHS covers from around the world, promo materials, a look at the materials used to make this release happen, all played to music from the film. Taken from a terrible source, there is nothing different about this sequence than what appears in the film, except for the Killer Workout title card. This is not the original trailer from when the film was released, but a trailer that Slasher // Video made to promote this release. It is poorly edited and doesn’t feel like a trailer. It is just a montage of footage edited to music from the film. I commend Slasher // Video for putting this disclaimer on the box and being so up front about it. Video were upfront about what the transfer would look like. What a lot of those in the community are forgetting is that sometimes the film elements can not be found or were lost a long time ago, so this would be the only way of releasing the film. If the lost footage for The Magnificent Ambersons or the Spider Pit sequence was found on a VHS and then released on blu-ray sourced from this VHS, the community would go crazy about the footage, not caring where the footage came from. 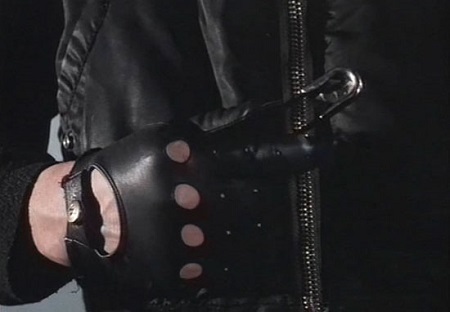 When the “Occupy Midian” movement was going on a few years ago with the discovery on a workprint of the full Nightbreed cut on it, something that was feared lost, the Clive Barker community went crazy over the found footage. We didn’t care that it was a VHS dupe. We cared about the footage. Cut to 2014, when Scream Factory released the director’s cut of Nightbreed on blu-ray, there were people who were mad that the “Cabal Cut”, the one that was a VHS dupe, wasn’t included on the disc because it contained footage that isn’t on the disc. They wanted everything they could get. These are the same people complaining that these Slasher // Video releases on sourced from the only footage that can be found. I find it very hypocritical that they would allow for one release to be in the worst shape and not another. It is all about preserving the film. If this Is the only way that we can preserve Killer Workout then I am happy with it. The picture quality is not terrible either. It is not a high def transfer, but it isn’t VHS bad either. The colors are muted, the blacks are crushed, and picture flickers from time to time. There are also both film artifacts AND VHS artifacts. This is probably the best the film will look unless someone finds the actual film elements. 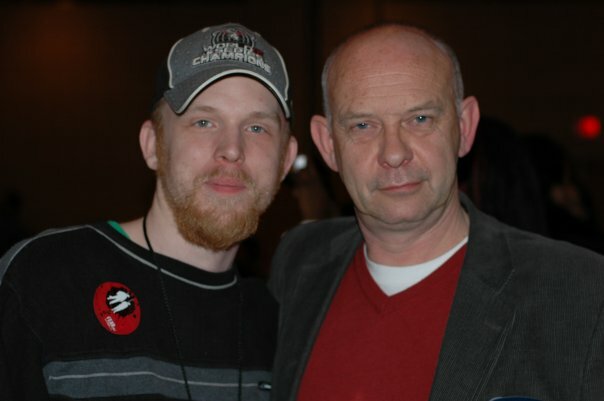 I am not going to give the picture a zero or anything like that. Slasher // Video had poor elements to work with, but they were the best elements found so I am giving the picture quality a two. It is better than some of the work prints that have been popping up on some blu-rays so there is that. Again, the elements negate a proper review, but I will say that the sound is flat, but there is no hissing or unwanted sound. The sound is appropriate for the release. Dialogue gets muddy a lot throughout this release. I thought that maybe the track was messed up in some way, but it turns out that is how the film sounds. David A. Prior and company did not record their sound all that well, so we are stuck with scenes that are unintelligible due to not being able to understand what is being said. Luckily, there are only a few scenes that are like that. Slasher // Video and Olive Films have given this release a very VHS feel in terms of the packaging. The front cover looks exactly like something one would find in the video store in the 80’s. The added stickers are a nice touch as video stores would liter their VHSs with stickers informing us or what genre the film is under or the always classic “Be Kind Rewind” sticker. Again, this packaging fits this release. 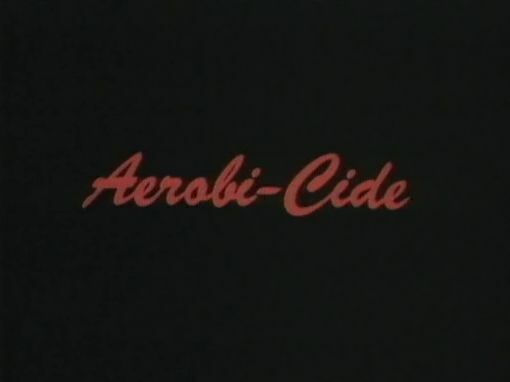 Released in 1987, Killer Workout (or Aerobicide as the title card reads) starts out with one of the funniest opening scenes I have seen outside of an actual comedy. A woman walks into her apartment after an aerobic workout. The phone rings and the answering machine picks up. The man calling is her agent saying that she was wanted for a photoshoot and that she needs to get down to the tanning salon so that she can get a tan. The woman goes to the salon, disrobes, and gets into the tanning bed. The way that she does all this is some of the most awkward acting I have ever seen. After the woman gets into the tanning bed, it bursts into flames. The woman is on fire, screaming for her life, all the while lying completely still. I had to pause the film at this point because I was laughing so hard. After I composed myself, I realized that the film may not be able to live up to this opening scene, but I knew that I had to watch the rest, just to see. 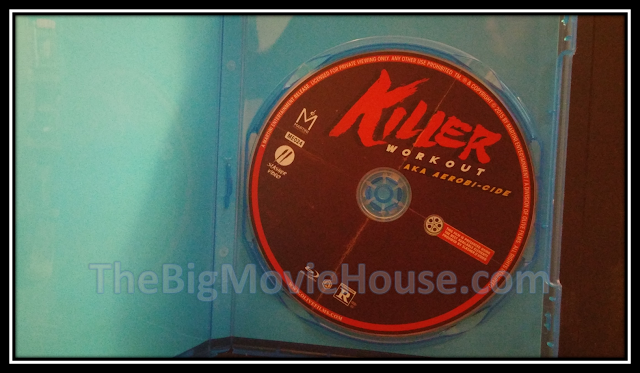 The main action of the film takes place at a gym (that they keep calling a salon) and the murders that take place within (and with out if you want.). There is a killer running around this gym killing people with a giant safety pin. Yes, a giant safety pin. That is the route that this film is going. Bodies start to pile up at the gym and the cops have no idea who is doing the killing. This is all well and good because this film is 82 mins, so we need to see some more deaths. There is a detective that shows up everywhere and does his job about the best that he could in this film. -The detective goes to a girl’s house to question her. Instead of politely knocking on the door and identifying himself, he starts banging on the door. The girl inside is scared. We then cut to the cop back outside saying “MISS, ARE YOU THERE? I NEED TO TALK TO YOU! I AM A COP!” This is another scene that made me laugh uncontrollably. -A guy is killed, inside the gym, with a weight. This is nothing special. There is a guy who comes over to see if the first guy is ok. He sees that he is not, but instead of running off to tell someone, he stays there until a random girl sees him right next to the body and screams “Oh my God, he killed this guy”. This scene, like many others in this film, goes nowhere, but is really funny. 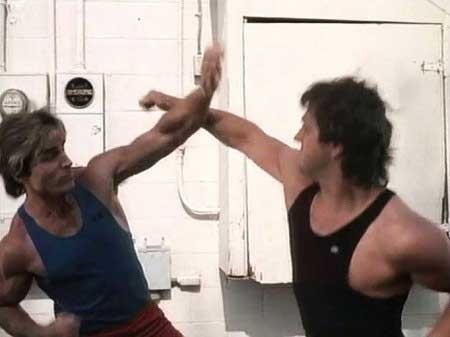 -The new gym trainer who shows up at the beginning of the film turns out to be a P.I. trying to track down a serial killer. The P.I. broke into the guy’s locker at the gym and found pictures of the lead girl. When the P.I. shows her the pictures she is clearly posing for these pics, which means that she knows the killer or the producers found someone who can not look natural in a photo. -The film has its own theme song that the people in the film listen to. I would find it kind of weird if I am at a gym, working out, that the people around are listening to a song about people being murdered in a gym. It is like this video that popped up on YouTube earlier in the year of a guy, on a plane that is getting ready to take off, watching videos of the 9/11 attacks. -The detective visits a guy who is in a room that is being guarded by a cop. After questioning the guy, the detective leaves. Out of nowhere, the killer shows up and kills the guy. There is no way that the killer could have gotten into this room without being seen by the cop. -Lastly, the cops, at no time during the film, close down the gym. This is a place where multiple murders happened and the cops don’t close down the crime scene. The killer could stand in the middle of the gym, holding the murder weapon in their hand, and the courts would most likely throw out all of the evidence because of contamination. Killer Workout is a better film than what I thought it was going to be. The film was directed by David A. Prior, who gave us Deadly Prey, which is one of the funniest Rambo rip offs I have ever seen. In some ways that film is funnier than the Hot Shots! films. Prior died in 2015, but he made one final film before he died. Here’s hoping that the film is as good as his others. 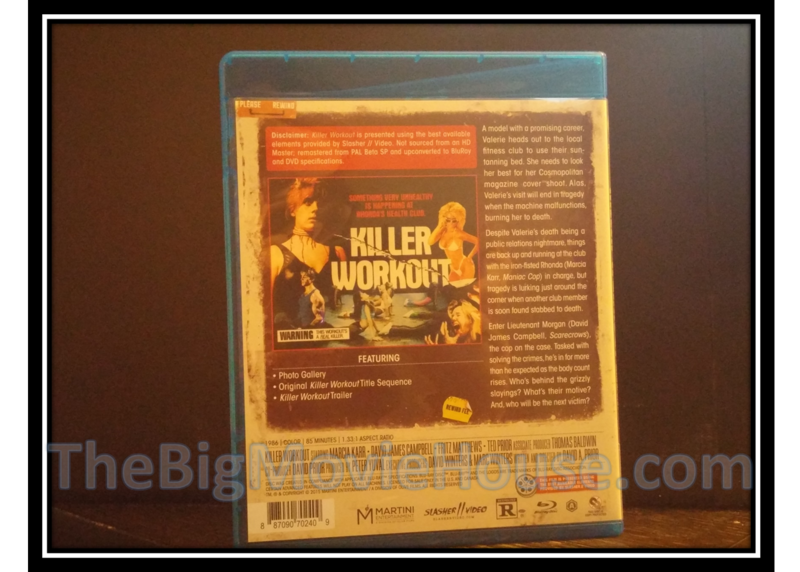 Killer Workout is a cheesy slasher film that has a lot of heart and heart goes a long way with me. Check this film out with some friends and you will all have a good time.